Safety Tips for Operating a Forklift | Hi-Lo Industrial Trucks Company, Inc.
Forklifts are very useful machines for transporting objects, especially heavy ones. While they are very handy, it’s important that the person operating the forklift follow some safety tips. If you have never operated a forklift, or been trained prior, don’t attempted to operate one. You should be qualified to operate a forklift to avoid accidents. Forklifts generally have a load capacity, and for good reason. Don’t exceed the weight limit, otherwise, the rear tires can lift off the ground, and the forklift can tip over. Although forklifts are powerful, they should be operated at a controlled speed. Never exceed the speed limit and slow down when making turn to avoid tipping over. Following these safety tips can help prevent accidents while utilizing a forklift to its best ability. 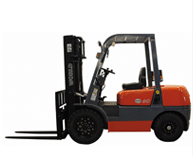 If you are interested in purchasing a forklift, pay a visit to Hi Lo Industrial Trucks Co. This entry was posted in Blogs and tagged interested in purchasing a forklift. Bookmark the permalink.